Eight-year-old Kai got the surprise of his life when Ed Sheeran appeared during his performance of “Thinking Out Loud”. Okay, so Kai is officially the most adorable child ever. 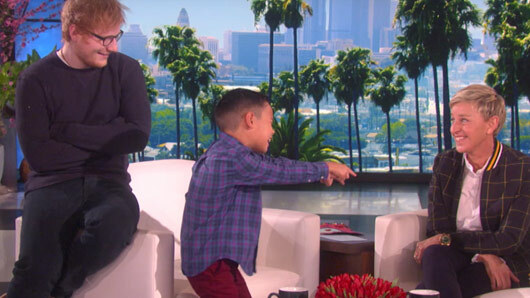 The eight-year-old singing sensation appeared on The Ellen Show on Tuesday to put on a special performance of Ed Sheeran’s song. During a particularly enthusiastic rendition, the world famous singer appeared behind Kai, casually taking a seat on the chair beside him. Of course, Kai was too involved in his heartfelt performance to notice the celebrity perched next to him. When his song came to an end, Kai turned around to face Ed and his reaction was the cutest thing we’ve ever seen. Stunned into silence, the young boy eventually managed to muster up the word “hi”. And if your hearts weren’t melting already, Kai also produced a Valentine’s Day card for host Ellen earlier on in the show, which described the presenter as his “girlfriend”. The hand made card also listed all of the reasons he loves Ellen and featured his school picture stuck inside a massive love heart. The chat show host asked if Kai had gotten what he wanted for his Birthday, to which he replied that he had actually wanted a baby brother who was, specifically, five years of age. Because, of course, all you can do with a new born baby is “rub his head”. However, Ellen was there to give Kai the next best thing: a trip to Manchester to watch his favourite football team Manchester City play in the Premier League. And his excitement was priceless. Now, excuse us whilst we go and recover from that cuteness overload. « Could The Big Bang Theory return for two new seasons?